Courtney, Addison, and I went out to the east coast for a week, 8/15 – 8/22. During this whirlwind trip, we visited New Jersey (including going down the shore to Seaside Heights), Virginia, and Pennsylvania. We went to Virginia to see my cousin Rod and his family. Going crabbing is one of the memories I share with Rod. On our last day there, he picked up a bunch of live crabs, cooked them up, and we feasted on them before heading out to go to Pennsylvania. Yum! In PA, we stayed near Lancaster, which is Amish country. Arriving around 6 PM, we checked into the hotel and decided to go to Hershey. The rain was horrendous! It was difficult seeing even with the windshield wipers going full speed. Fortunately the rain let up a little so we didn’t get too soaked going between the car and Hershey Chocolate World. The next day, we drove back to NJ after a little shopping. Some of the photos from the entire trip may be viewed here. I think you’ll be able to tell the photos are in groups. The first group is from the flight into Newark airport where you can see the NYC skyline and the Statue of Liberty. 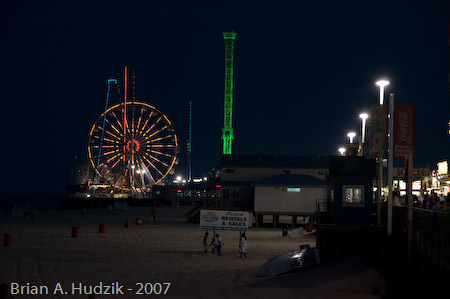 Next up is a group of photos from Seaside Heights, NJ. Those are followed by some photos where trees have literally grown into a fence. Seeing is believing! A farm across from the house where we stayed in Virginia is in the next group. An Amish buggy is followed by a group of flower close ups. This entry was posted on Monday, August 27th, 2007 at 1:59 am and is filed under Photography, Travel. You can follow any responses to this entry through the RSS 2.0 feed. You can leave a response, or trackback from your own site.